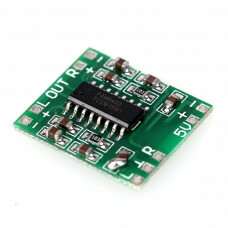 This Audio Amplifier Module is based on PAM8403 which is a 3W, class-D audio amplifier. It offers low THD+N, allowing it to achieve high-quality sound reproduction. The new filterless architecture allows the device to drive the speaker directly, requiring no low-pass output filters, thus saving system cost and PCB area. With the same numbers of external components, the efficiency of the PAM8403 is much better than that of Class-AB cousins. It can extend the battery life, which makes it well-suited for portable applications. Input audio should be via shielded wire for best performance. Use proper filtered power supply with good filter capacitors. Take care not to short speaker wires else IC will get damaged. Make sure power supply never execeds 5.5V else IC will get damaged. Use regulated power supply.